So here it is... the biggest burlap bucket I've made for sale so far! 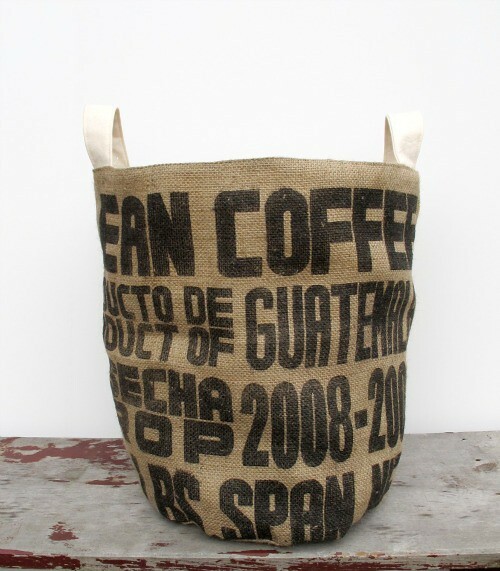 It was created from a carefully selected section of a rescued coffee sack from my local roastery (Gimme!). I lined it with a sturdy and repurposed length of canvas and gave it a little extra structure with bamboo batting. Eco, green, hand-crafted, and made with happy intentions... this bucket is ready for filling! It would be a wonderful addition to any living room... great storage for a throw or extra pillow. And for those of you with lots of extra WIPs scattered in many baskets, well here's a spot to keep them all together. It measure in at a hefty 16 inches tall by 12 inches in diameter and was just featured in the Food Network Magazine's holiday gift guide for food lovers (and coffee lovers)! It's available right here securely through Paypal. Phew! that was fast! Thank you! That was fast! I'm just catching up now... It's gorgeous! More to come, yes?